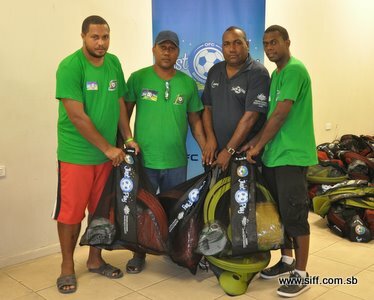 After delays which were caused by shipping and the clearance of the consignment the Solomon Islands Football Federation (SIFF) is relieved to finally hand over the equipment to the schools. The 6-week implementation program expected to have been started 3 weeks ago will now be able to get off the ground. Before the equipment packs were issued out a brief meeting was held to discuss the implementation program for each school and community. It was agreed during the meeting that due to the school break next week the implementation of the 6-week program in schools will have to wait until classes resume. The starting date for the implementation will, therefore, be Monday 3rd October and it will run until the 11th of November after which a 1-day tournament will be held to wrap up the program for the year. The date for the tournament is Thursday 17th November. During the implementation the SIFF projects office will closely monitor activities in each school and community and collect data for assessment and integration into future planning for the project. SIFF special projects manager, Phillip Ohoto’ona, presented each school with their allocation of equipment and informed the teachers and community volunteers to make sure that they are used for the full benefit of their students. “Our priority is for our kids to fully participate and enjoy the Just Play program in your schools and communities. We wish you all the best for the break and look forward to start working with you again once the school term starts,” Ohoto’ona says. Each Just Play pack issued has 2 balls, 8 bibs, 4 cones, 8 markers, 8 speed rings, a whistle and a pump and each school and community was given 4 packs. A single Just Play pack is designed to cater for a training session for up to 10 children. Schools who did not attend the session today are asked to contact the SIFF special projects office on 26496 ext. 203 to arrange a suitable time for them to receive their equipment. The Just Play program is funded by the Australian Government through its foreign aid arm, the Australian Agency for International Aid (AusAID).